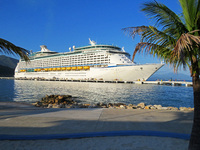 Eight day trip into the Caribbean, nice ports, good ship and overall nice experience. The ship was in good condition and nicely decorated for Christmas. The entertainment was good and diversified. The fitness center was not too crowded which is nice and the equipment was plentiful and varied. We like the promenade design with shops and eateries and the Duck and Dog Pub. 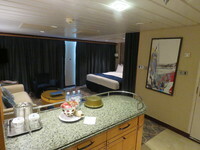 Surprisingly they have the suites located on deck 10, just below the activities deck which means you should pick your room carefully or the overhead activity can make the room noisy. Eating in the Windjammer Cafe can be hectic at prime time and specially when there a lot of children aboard. The noise level is very high and is not helped by the constant playing of dreadful noisy music. Eating in the dining room is delightful and the food is generally good and certainly plentiful. Overall very satisfactory trip. 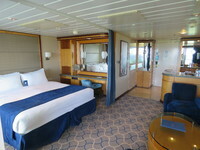 The room was really nice, roomy and nicely appointed. Plenty of closet and drawer space.